President Muhammadu Buhari will on Sunday, embark on a three-day official visit to the United Arab Emirates (UAE). A statement issued by the Senior Special Assistant to the President, Garba Shehu, in Abuja on Saturday, said during the course of the visit, Buhari would join the Secretary General of the United Nations, Mr. Ban Ki-moon, Crown Prince Mohammed bin Zayed al-Nahyan of Abu Dhabi and other participants as a special guest of honour at this year’s edition of the World Future Energy Summit. The statement explained that the summit, which is now in its ninth year of existence, has developed into one of the world’s most influential events dedicated to advancing future energy, energy efficiency and clean technologies. It said in a move signalling Nigeria’s re-engagement with the Middle-East region, Buhari would also lead a team of his ministers to bilateral talks with the government of the UAE. According to the statement, after the talks, a number of agreements between both countries on economic, trade and bilateral relations are expected to be signed. He will be accompanied by the ministers of Power, Works and Housing, Petroleum, Environment, Justice, Trade and Investment, Finance and Foreign Affairs, as well as the National Security Adviser. 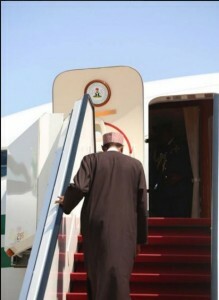 Buhari will also meet with Nigerian professionals in the UAE before returning to Abuja on Tuesday, the statement added.